Snow falls on Walnut Street in Center City Philadelphia, Tuesday, March 20, 2018. 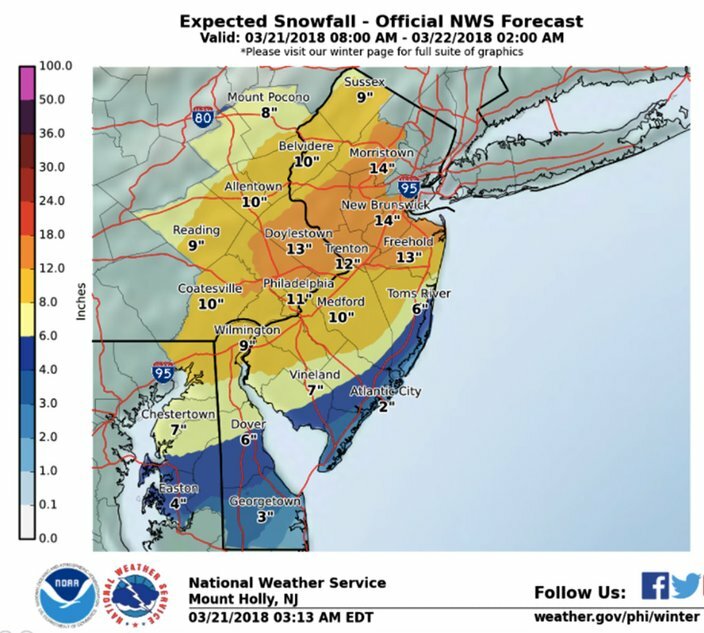 With the full fury of a mid-March nor'easter upon us, forecasters are warning the dangerous storm will likely result in impassable roads and perhaps even more power outages than caused by two coastal storms that ripped through the Philadelphia region earlier this month. 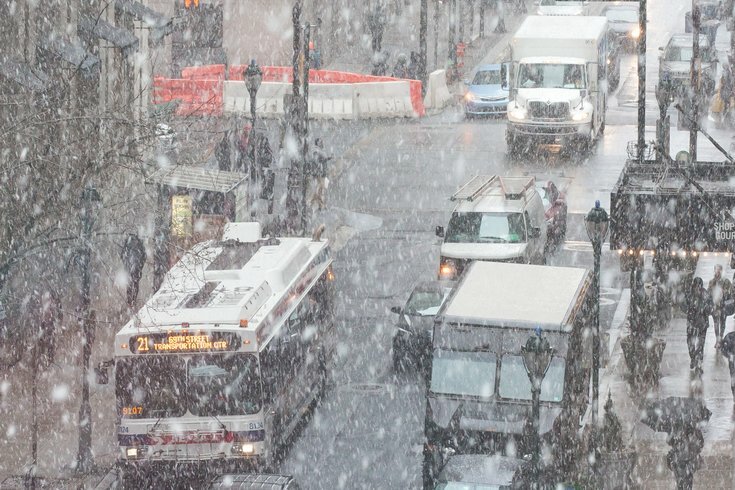 Philadelphia is in the crosshairs, with substantial impact expected along the I-95 corridor north to I-80, the National Weather Service warned. A winter weather warning is in effect for the region through 2 a.m. Thursday. Snow has been falling in the colder northern suburbs for several hours, with sleet just turning to snow in Center City about 10 a.m.
Mid-morning, the storm was beginning to have an impact on area road conditions in some places. Forecasters are advising people to forgo travel and stay home. Significantly reduced visibility can be expected. But the impact looks to worsen later Wednesday. With heavier snow to spread across the region, and winds gusting at 25-35 mph, trees and power lines will be at risk of coming down, potentially leaving hundreds of thousands of customers without power, forecasters warned. Snowfall rates as high could reach 3 inches an hour on Wednesday afternoon. Thundersnow could make a return. There is a potential for coastal flooding during high tide cycles through the storm. Minor-to-moderate coastal flooding is expected with the high tide cycles on Wednesday and Wednesday night. Storm-force winds and rough seas are expected on the coastal waters of New Jersey and Delaware, and on Delaware Bay. The snow is expected to taper off late Wednesday night. Wednesday: Snow. The snow could be heavy at times. Some thunder is also possible. High near 33. Northeast wind 13 to 15 mph, with gusts as high as 25 mph. Chance of precipitation is 100 percent. Total daytime snow accumulation of 5 to 9 inches possible. Wednesday night: Snow, mainly before 11 p.m. Low around 30. North wind around 14 mph. Chance of precipitation is 80 percent. New snow accumulation of 3 to 5 inches possible. Thursday: Partly sunny, with a high near 42. Northwest wind around 18 mph, with gusts as high as 32 mph. Thursday night: Mostly cloudy, with a low around 28. Northwest wind 8 to 11 mph. Friday: A slight chance of rain and snow showers after noon. Mostly sunny, with a high near 41. Northwest wind 9 to 15 mph. Chance of precipitation is 20 percent. Friday night: Partly cloudy, with a low around 26. Saturday: Mostly sunny, with a high near 43. Saturday night: Mostly cloudy, with a low around 29. Sunday: Partly sunny, with a high near 45. Monday: Mostly sunny, with a high near 46. Tuesday: Mostly sunny, with a high near 51.